I’m heading up to Banff National Park tomorrow and the recent warm weather has me thinking about bears. It’s far too early for them to wake up so I don’t expect to see any. It did prompt me to look at the photographs from watching this mother Grizzly with her cub during a visit to the Khutzeymateen two years ago. I can’t wait to see bears in both places starting later this spring. This entry was posted on February 21, 2016 by Christopher Martin. 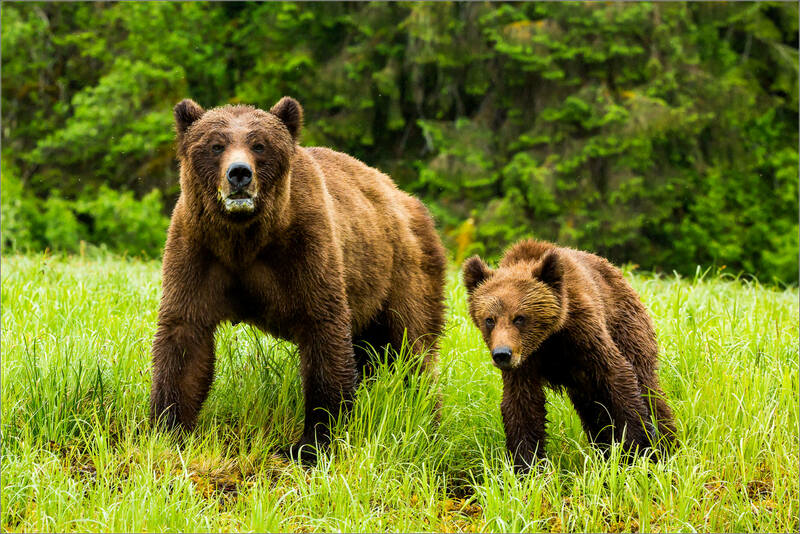 It was filed under Alberta, Bears, Wildlife and was tagged with bears, British Columbia, Canada, cub, Great Bear Rainforest, grizzlies, Grizzly Bear, Khutzeymateen Provincial Park, mother, Ursus arctos horribilis. Beautiful photos, what amazing experiences you get photographing nature. Love it! Nice shots! The closest I’ve seen is a black bear. Amazing photos. Thanks for sharing the beauty of our world and the creatures that inhabit it. great photography, these photos are so amazing and interesting! Beautiful photographs! Looking forward to seeing more of your stuff! Great shots. I only dream of be a wildlife photographer. With those nearly fill the frame shots, about how far away where you? What power of zoom where you using (including camera zoom multiplier)? Hi – at the closest I was ~25m away as I was on a small boat and my guide approached the Bears slowly from the water. I used a 500mm lens on a full frame dSLR camera. Oh my gosh, these are beautiful!! Wow, stunning pictures! I can imagine that you love to photograph them! I love the pictures. Not just the vivid colours and wonderful animals, but also the lines. Especially in the last picture. Great composition! que bella es la naturaleza y lo que hábitat en ella ,cuidarla es nuestro trabajo lindas las fotografías. Oh great pictures especially capturing them midway through their chewing. THank you for sharing these. I will be terrified getting that close too close to them. Other than wonderful photos. Those are some amazing pics! How did you get so close? Wow absolutely breathtaking shots! Kind of reminds me of a real life version if the animation brother bear! Love it! Wow! I really love these pictures! Very beautiful!!! Love these pictures! I was in Banff a few years ago, just want to go back! Just wonderful and interesting to learn how you got to photograph the bears. I have always wanted the opportunity to do so. 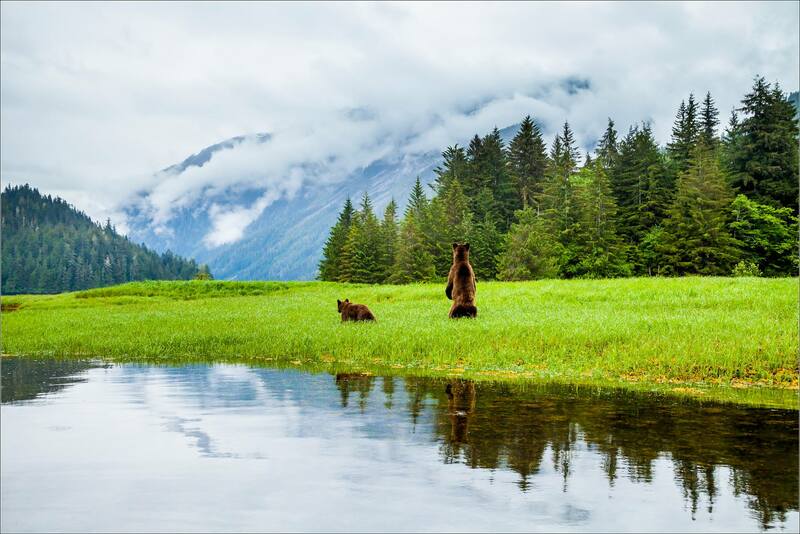 These are fabulous shots – love bears and to see them beautifully portrayed in their natural environment is extra special. Thank you! Excellent shots!! I will be so scared to do the shoot! Wow, another amazing experience! I am curious, how close do you get for your pictures? And do you ever think you could be in danger? In this place, the Khutzeymateen Provincial Park in northern BC, you visit by boat and don’t make landfall. So all of the encounters are from a zodiac or from the deck of a sailboat so although I can be quite close, it is not dangerous. The gentleman who is the guide and captain that I tour with has been in that inlet every summer for 35 years so his experience keeps things safe and prevents encounters from escalating in a bad direction. Such beautiful pictures! All of them are so beautiful! Canada is that green right now? And people deny climate change. tsk tsk. Beautiful shot though sir! These images were from June 2014 north of Prince Rupert, British Columbia. It has been a mild February in Alberta, where I live, but it’s not that lush in either place right now. I certainly accept climate change as fact but it hasn’t accelerated that fast here yet. What a spectacular opportunity to view them in their element. The color vibrancy and contrast between the green, lush grass and the velvety brown fur. Beautiful! Best of luck at the Banff National Park! Thank you David! They are amazing animals and the love the momma a have for their cubs is deeply moving to watch. Gorgeous pictures, in May of 2015 during the journey between Banff and Jasper we spotted a Black Bear to the side of the road and managed to capture some video footage which was one of the most incredible moments of my life. Such a frightening animal from what we see on our TV screens but in the wild they look so innocent. 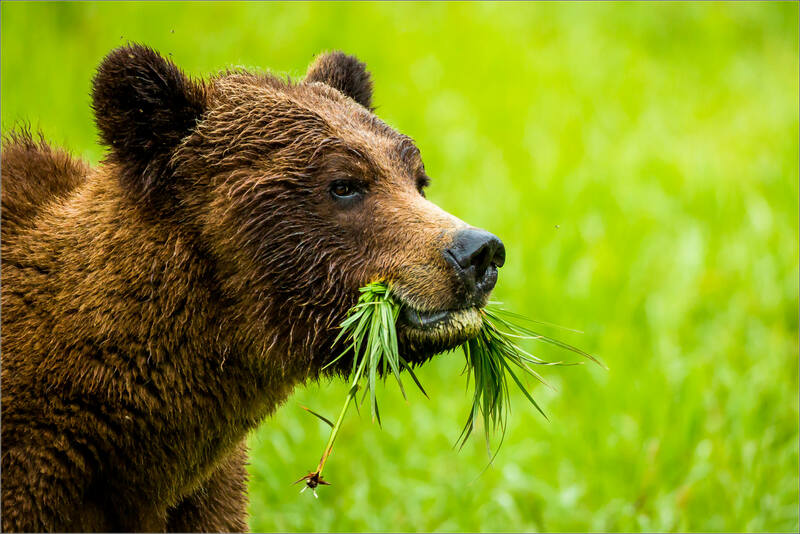 Lovely…especially the bear munching on grass. Beautiful shots. Absolutely love them! Amazing grizzly pics. They def outclass mine taken optimistically from the back of a 4WD!! Stunning! If you look at them they seem so sweet but actually they’re one of the most dangerous animals! Would someone check out my new blog frankmalgar.wordpress.com? Hey there, I’m 13 years old and I am currently in GIN (global issues network) exploratory. Please check out my blog if you’re interested. Thank you! Wow! Very awesome and clear photos! Incredible photos! But, I’m scared sh!tless when it comes to bears. You’re a brave one.WHY DID I LOOK AT THESE RIGHT BEFORE BED?!?!? stunning pictures. I am so jealous you have seen these. On our trip to Yosemite we were hoping to spot one but they were all hiding 😦 ! Stunning shots… great work done. Great photos, may I ask what lens you are using? Hello – thank you. During that visit, I used mostly the Canon 200-400 f/4 lens. The only other lens was the 24-105 f/4 which was used for the last image in that series. Thanks, I’m always curious about which lenses have been used. Admirable talent and cool nerves! Woah, amazing shots! So great to see such beautiful animals in their natural habitat. Amazing shots! Makes me despise these four walls even more! I gotta get outside. Yet…here I am. I hope you get out there soon! This photograph is absolutely amazing. 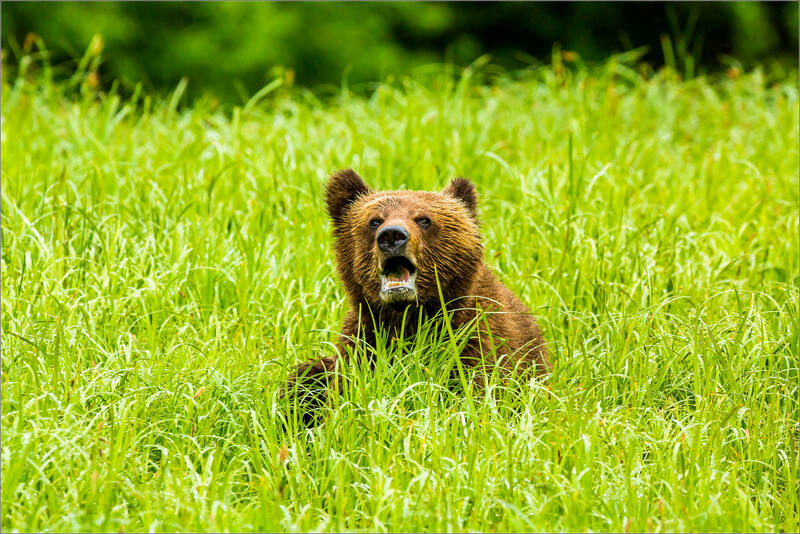 I love all wildlife, including bears and you have captured their moody behavior perfectly. I am looking very forward to a lot more visits to your blog. Wow! Amazing photos. I adore the last one. Such incredible animals. You are so lucky to be able to get so close to them. I like all the photos but especially the wide shot of them in their habitat. That’s interesting because I have been thinking a lot about bears recently and hoping to see them in Banff/Kananaskis this year. Your wonderful photos remind me of that other great place! Absolutely stunning. Such powerful and amazing animals. I would have loved to have been there with you! Thank you. I did – found a wolf pack taking down an elk which was amazing. I hope you scratch a visit off of your list sooner than later. Yup! We start dreaming about those grizzlies about now. They are such amazing creature. Wonderful shots! Love these pics and the story. Outstanding! Amazing pictures! Enjoy your time in Banff, we will be there in June for the first time and I am really looking forward to discovering it! You will love it. June is one of the best times to visit Banff. Make sure you explore Kananaskis as well – the area around the Highwood Pass is magic! Thank you! We have a long list of to see and to! We are flying to Edmonton and driving to Victoria over 10 days! What a great trip! A lot of ground to cover in that time – enjoy all that you see! Amazing – each one of them! Beren op visitie leuk he! Wow, shots are great! How did you manage to get so close to them? Same question here! I guess it’s through special camera affects or so. Hi Anro and Noor – No special camera effects :). 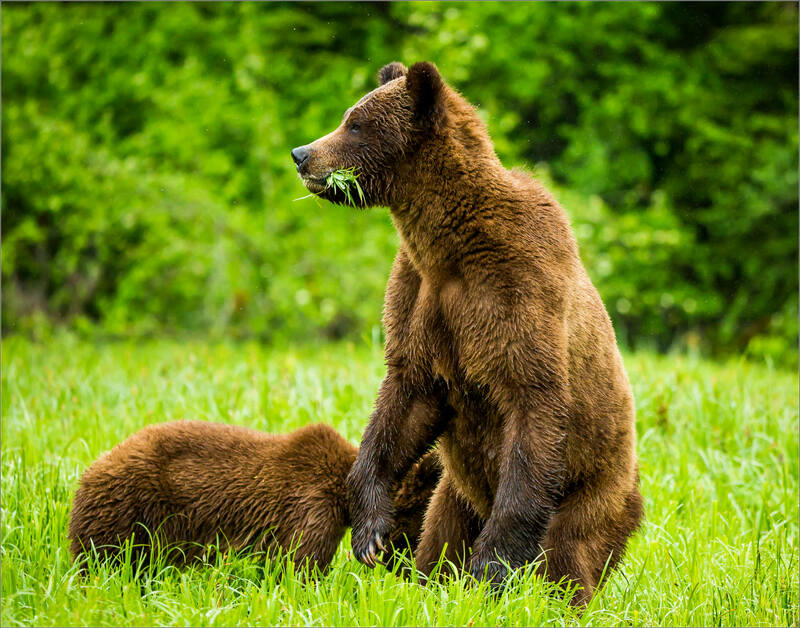 The Khutzeymateen is a provincial park set up to be a Grizzly bear sanctuary. The bears there have never been hunted or harmed by humans so they by and large ignore them. I go there with a guide who knows many of the bears and their histories. We never make landfall and all encounters are from a zodiac boat. That allows us to get quite close without stressing the bears. When they show any discomfort or deviation from their natural movement or behaviour, the guide (who has been there for 6 months every year for 36 years) leaves. I wouldn’t want to visit these amazing creatures in this location any other way. Wow! That’s really interesting to know! It’s really amazing that animals who are faced to no human harm, they act friendly and trusting! The world of animals is so interesting!